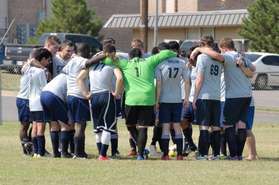 We are the Southwestern Oklahoma State Men’s Soccer team. The team was formed in the fall semester of 2009 with the view to give soccer players wanting competition a nice outlet to do so. We participate in the Oklahoma Collegiate Soccer league which is sanctioned by the Oklahoma Soccer Association, the U.S. Soccer Federation and FIFA. The OCCSL is the premiere collegiate club league in the state which sends 2 represenatives to regionals during the fall in route to the NCCS nationals organized by NIRSA. Game was forfeited due to OSU's lack of players and will not be made up. SWOSU now has their first "3 points" and is right back in the race for playoffs. There are 5 games remaining and SWOSU is looking to earn a spot in playoffs. More info to come. The season has had a very paused session and looks to have a very eventful April. The only matches played in March included the defeat to OU @ Norman. The season was paused for nearly a month due to referee unvailablity while hosting OU-B and other scheduling circumstances due to easter with OBU. OBU match is still yet to be rescheduled.